Located on the north side of Chicago, most people know Wrigley Field as the home of the Cubs. However most people do not know that Wrigley Field has been the site of more professional football games than any other stadium. The history of the stadium dates back to 1914, when Charles Weeghman decided to build a ballpark for his baseball team, the Chicago Whales. Located along Clark and Addison Streets, construction began on the 14,000 seat ballpark on March 14,1914. Construction was completed just over a month later in April 1915 at a cost of $250,000. Originally known as Weeghman Field, the Whales played at the ballpark for just two years before going bankrupt. The Chicago Cubs played at West Side Grounds until Charles Weeghman bought the club and moved them to his ballpark in 1916. The first Cubs game at Weeghman Field was in April 1916. In 1920, Weeghman Field was renamed Cubs Park, and Weeghman sold the club to William Wrigley Jr. In 1919, the Chicago Bears were founded by the AE Staley Company in Decatur, IL. The team was originally known as the Staleys and played their first two seasons in Decatur at Staley Field. After the 1920 season, the Staley’s moved to Chicago and Cubs Park. The team played their first game at the ballpark on October 16, 1921 when they played the Rochester Jeffersons. The following season the team was renamed the Chicago Bears. In 1922 and 1923 the ballpark was expanded as the grandstand was moved and bleachers were added increasing the capacity to 20,000. Cubs Park was renamed Wrigley Field in 1926 when the grandstand was double decked and the playing field was lowered. This expansion increased the capacity to over 38,000. Bleachers and the hand operated scoreboard were added in 1937. For almost five decades the Bears called Wrigley Field their home. In order for football to be played at Wrigley Field, the gridiron was laid out over the infield and into left field. Bleachers were placed in right field. 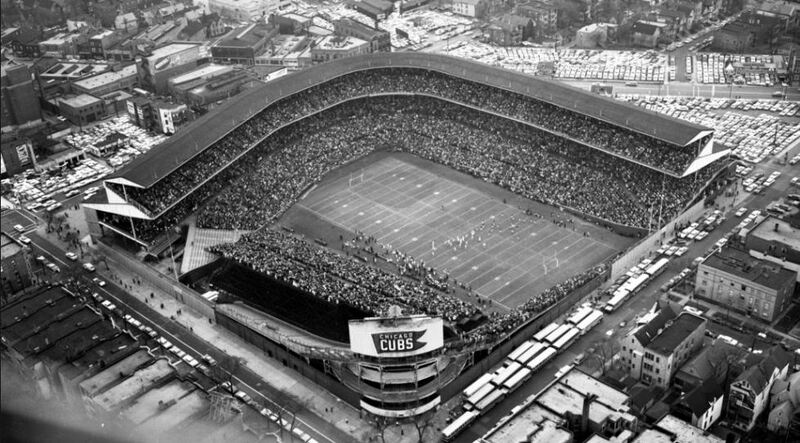 By 1970, Wrigley Field became to small for the Chicago Bears as the NFL and the team became very popular. The Bears played their last game at Wrigley Field on December 13, 1970 with a win over the Green Bay Packers. 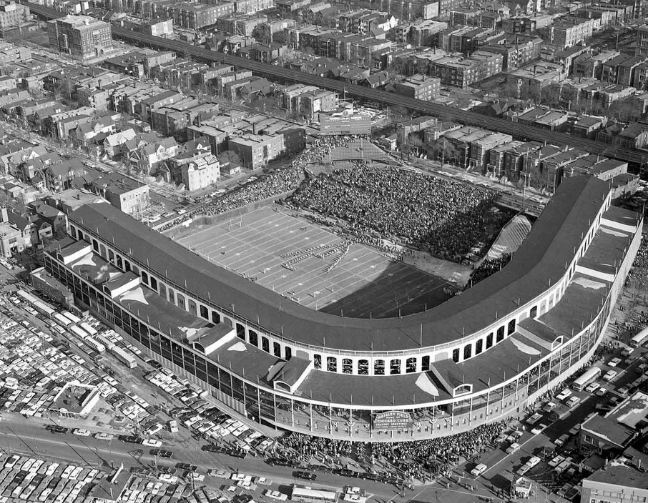 The following year the team moved into Soldier Field on the south side of Chicago. The Cubs continue to play at Wrigley Field as it has changed very little since the Bears left. Lights were installed in 1988 and suites were added between the lower and upper decks in 1989. Today, Wrigley Field remains one of the most popular ballparks in baseball.